There is a slight error in the last review - they actually serve 5 real ales but only one (Worthington's Cask) dispensed via gravity into a jug and then your glass. 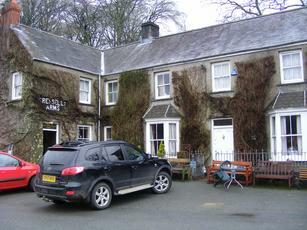 The others (Doom Bar, Caffle Quay Ale & 2 guests) are dispensed via handpull. The Quay Ale was 4/5 but the Worthington's was superb. No idea if this is a regular occurrence but today there was also a real cider on sale (Gwynt Y Ddraig's Happy Daze). Stunning views as other reviewers have indicated. The historic pub interior is of regional importance according to CAMRA. Wonderful. As per previous reviews, lovely pub worth a visit. Great views of the river sat outside the pub. They Only appear to serve a single real ale worthingtons keg. This wonderful riverside pub first opened over 200 years ago as The Square and Compass, and became the Cresselly Arms in the 1890s when rebuilt and extended. Since then, very little has changed except the removal of a thin partition between the bar and former kitchen to make a slightly enlarged drinking area, with flagged floor and heated by an Aga range. It is also heated by wonderful conversation and a welcoming atmosphere second to none; beer dispensed by nothing more than gravity from a barrel on stillage, into a plastic jug, into a glass. Wonderful! This is exactly how pubs should be - tremendous. Beer straight from the barrel in someone's front parlour - Superb. They still serve the beer straight from barrells at this simple yet highly effective pub which remains the centre of a small community. Straddling the quay the Arms' view of the Eastern Cleddau and Welsh wilderness. The beer is as excellent.